The story of a place begins with the story of the people who live there. The Fattoria Fibbiano farmhouse was built in 1707, but became part of our history almost three centuries later. Since 1997, when Giuseppe Cantoni, whose industrial career had taken him to live abroad, decided to return to Italy and to the roots of his family, farmers for generations. Giuseppe, his wife Tiziana and their sons Matteo and Nicola, chose Tuscany, and set out to look for a smallholding. 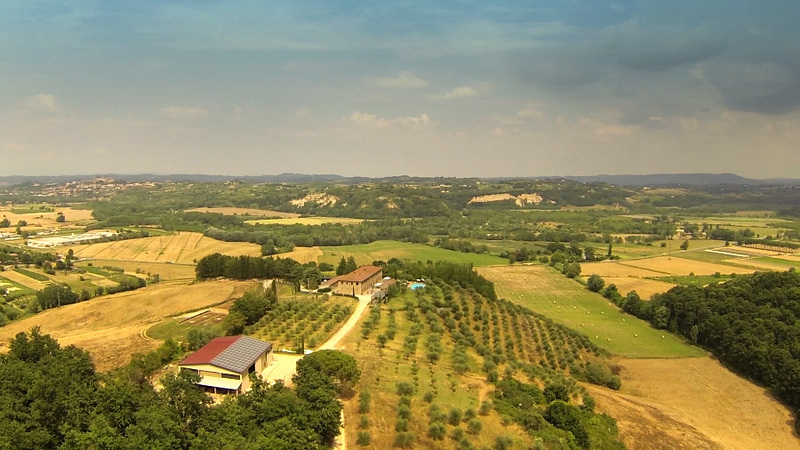 When they saw Fattoria Fibbiano it was love at first sight, and their new life began from here. A simple yet full life, in step with nature and the purest of things, far from the hustle and bustle of the city. The restructuring works began to build the agritourism it is today, true to the local traditions but ready to welcome new stories, meetings and experiences. During the summer, thematic dinners can be organised on request and served on our panoramic terrace, using only products sourced locally and traditional cooking methods, such as the old wood-fired oven. On request we can organise tasting events, using our wines, extra virgin olive oil and local dishes, as well as cookery courses hosted by our excellent Tuscan cook. We are open all year round, and our guests are welcome to take part in our olive and grape harvesting during the season. Outdoors, we can visit the whole estate, take a stroll through the olive groves and vineyards or relax in the sunshine by the beautiful pool with its views over the valley. The welcoming atmosphere, the attention to detail, the direct contact with nature and the vicinity to some of the most attractive historical sites of Tuscany; San Giminiano, Volterra, Siena, Lucca, Pisa, Florence, San Miniato, Lari, Vinci, Calci, make Fattoria Fibbiano the ideal destination for anyone looking to spend a relaxing holiday that offers a wide range of activities and alternatives. Once you get here, you'll soon forget the hectic rhythms of everyday life, getting into the right mood to enjoy all the pleasures our land has to offer. Fattoria Fibbiano has 7 beautiful apartments, each going by the name of a flower or the name of a plant. All the apartments have a fully furnished kitchen and lounge, a Wi-Fi connection and a full range of comforts to make your stay as pleasant as possible. They cater for two to seven people: so take a look, and choose the one that best suits your needs.